I recently did a hack-a-thon: nearly 24 hours of intense coding to transform a nascent idea into something useful that can wow judges and attract investment. It all began when my friend David (read his thoughts here) told me he really, really wanted to go to AngelHack this year. 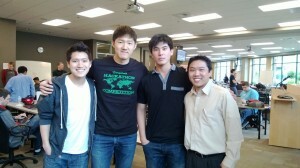 He ran his idea by me and asked me to help code it up and pitch to the judges. This is when I learned my first lesson. Growing up I was basically a self-centered achiever. My mind has always bubbled with ideas that I wish other people would help to make a reality. I’m sure many of you have felt the same way, especially in group projects–you want your ideas to be heard, appreciated and implemented. This time though, likely due to what I’ve been learning about servant leadership, I felt a strong desire to fully support David in the ideas he wanted to work on–to do whatever it took to help him succeed. Surprisingly, a few days after I agreed he changed his mind and asked me what I wanted to do instead. I don’t think this is the point of lesson #1, but I was delighted to get support for my idea after all. 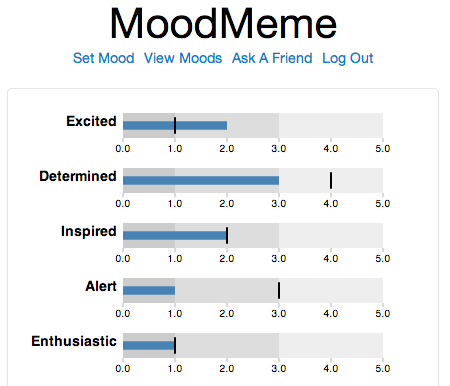 We ended up building a prototype of MoodMeme, an app that helps you track your mood and notifies your friends when you’re down so they can help (go ahead and enter your mood–there’s a little surprise :-)). Are there ideas you want others to help you accomplish? How can you do for them, what you would want them to do for you? 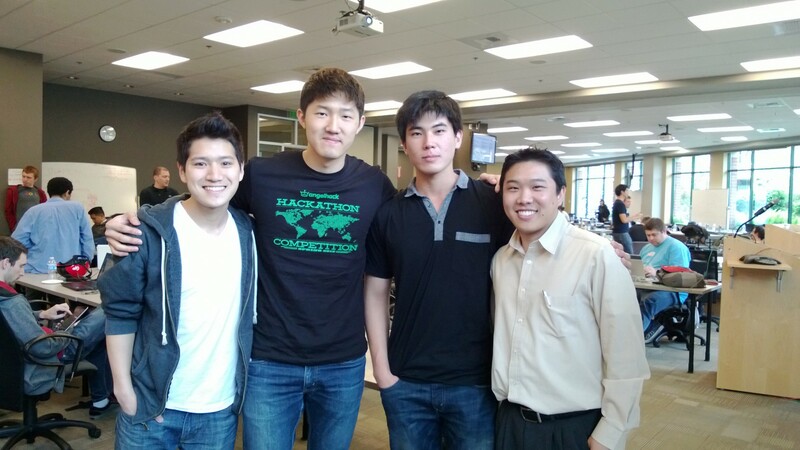 On the day of the hack-a-thon we had a team of four. Gary built the Android app that prompts you for your mood while Sean mocked up the experience. David built the web app, and I was responsible for visualizing mood data with D3. By the end we had a working prototype and a pitch that together got us into the final round of judging. We were exhausted, living on adrenaline and Red Bull. After a first round of judging, the emcee announced the six finalists who were to pitch to the full panel of judges. We were to go third. My anxiety made it hard to focus on the first two presentations. Sean connected his laptop to the projector while I opened my transcript. There was great applause. Several of the judges, engaged me with insightful questions and everyone seemed satisfied by the end. The demo and pitch were a success. Half an hour later, the judges re-appeared and announced the winners, beginning with the honorable mention. Then the prizes from sponsors were distributed. Then they awarded second place. My mind raced through the pros and cons of each of the 6 pitches. I felt like MoodMeme was the most polished, although the second place winner had a more impressive product. Could it be? Could we have won first place? We didn’t win. We didn’t even place. Thus I relearned lesson #2: God’s grace makes all the difference. The Scriptures are replete with texts like: “Unless the Lord builds the house, those who build it labor in vain. Unless the Lord watches over the city, the watchman stays awake in vain” (Psalm 127:1) and “Many are the plans in the mind of a man, but it is the purpose of the Lord that will stand” (Proverbs 19:21). But what about our merits? Aren’t a group of people coding away at 5am, chugging Red Bull what it takes to win? Isn’t it the preparation and mad skills of these rockstar hackers that matters? Yes, merits matter. You have to build, watch and plan. But God’s purpose determines the outcome and to take it a step further, our merits themselves are a grace from God, as Paul proclaimed: “Rather, [God] himself gives everyone life and breath and everything else” (Acts 17:25b). Merit is grace. Three grumpy guys harmoniously working together at 5am is a gift from God. Writing a compelling pitch in less than an hour is a gift from God. Everything “just working” and being more productive than ever before is a gift from God. Getting psychology papers on moods from UW Professor Christopher Barnes at a serendipitous meeting far in advance of the hack-a-thon is a gift from God. Everything, from our abilities to the generosity of the AngelHack sponsors and volunteers to the judges’ final decision, are from God (Proverbs 21:1, James 1:17). What will you do with the grace God has given you? Even though we didn’t win, I was amazed at the response after the event. Several people approached me and told me they hoped we kept working on the product since they felt like it was much needed. One woman suggested that it could help doctors finely tune treatments for patients struggling with depression. One man suggested that we incorporate weather since many Seattleites suffer from seasonal affective disorder due to the lack of sunlight. 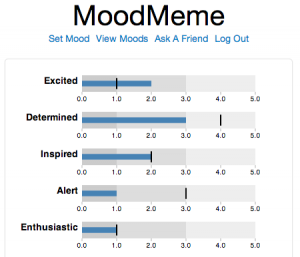 What set MoodMeme apart from other mood tracking apps is that we wanted to proactively address negative moods–it was more about mood management than simple tracking. Some of the ways we do this might be a bit gimmicky (you know what I mean if you entered your mood earlier), but the heart of the application is that it helps you love your neighbor as you love yourself (Mark 12:31). When you know how your neighbor feels, you’re better able to serve them and do good to them. What if technology could help you obey these words? Check out MoodMeme here. Let me know what you think in the comments below. If you want to be part of movement that creates, promotes and uses technology to help people fulfill the commands of Jesus, please like this, tweet, +1, pin, comment, etc.